I have, as probably most of you, no Madeleine mold and really didn't wanted to buy some just for this recipe. But - I once brought my mother Calison-molds from Paris (explanation and pictures for Calissons), so I thought I am going to try it with this form. No idea wheather the form made a difference, but anyhow, the Calisson-"Madeleines" turned out well, but when I tried to fill them, they were too dense and compact. Some broke, some were so solid, the filling came back out the pipe. So after some attempts I stopped and decided to go for plain "Madeleines" and top half of them with what was intended as the filling, and the other half with white chocolate ganache. 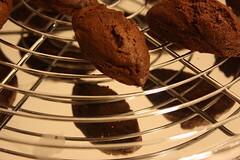 Thanks to Margo of Effort to Deliciousness who was so brave to choose this TWD-recipe for Chocolate Fluff Filled Madeleines. You can find the recipe on her page, or in Dorie's book on page 170 and 171. Im glad they tasted good..they look great. I made mine vanilla flavored! It looks like those pans worked beautifully! I thought these were nearly impossible to fill. Thanks for baking with me this week! The sauce sounds wonderful! I skipped the filling and frosting myself.